Because I loved the trip into Machu Picchu so much when I found a women’s group walking in Tuscany at a time that really suited me I signed up. I paid using international money transfer. An invisible intermediary bank ripped out £15 for ? and with neither I nor the recipient knowing about it. The intended recipients said I was €15 short and I said not. In the end I contacted the British bank, Yorkshire something or other and it wasn’t even them but yet another bank. Truly an invisible intermediary, Barclays Bank. Bet their bonuses are good this year! The Yorkshire bank was really very helpful and refunded the £15 ripped out by Barclays. Credit card if there is a next time! Anyhow, I was very excited about the trip until 2 things happened. Getting sick was the first one and I’m now assuming with a day to go I’ll make it albeit fatter and less fit. The second is a strange problem: a women-only trip with two self-described guys on it, according to their Facebook pages. Guys? Women only trip? So I’m assuming they are F to M trannies. Even that leaves me puzzled. Why, if you are working to be a guy would you still want to see yourself as a woman? Sounds like having a bet both ways. It’s a new world to me and, since it is a trip for women I am not looking forward to the social aspect very much. The walking, yes. Perhaps the wonderful group of women on my recent trip in Peru left me with a too high a bar and no group trip will ever be as good again? I hope not as I have two more trips booked with groups. Enough! I meet the group in the Pisa airport early Sunday afternoon. Until then it’s all conjecture. So, tomorrow, train from Florence to Pisa, then a bus to Pisa airport. I’m hoping to see an irresistible town along the train route that I’ll have to come back to for the two spare nights I have before flying out to Madrid. And, if I have time in Pisa I’ll look for THE tower before I bus to the airport. Meet the group in the airport and off we go for a week of walking in Tuscany. We’ll have a fixed base from which we’ll go out each day. That part I’m looking forwards to. Totally different topic, totally different. Remember the men’s haircut from Spain I called a reverse tonsure? 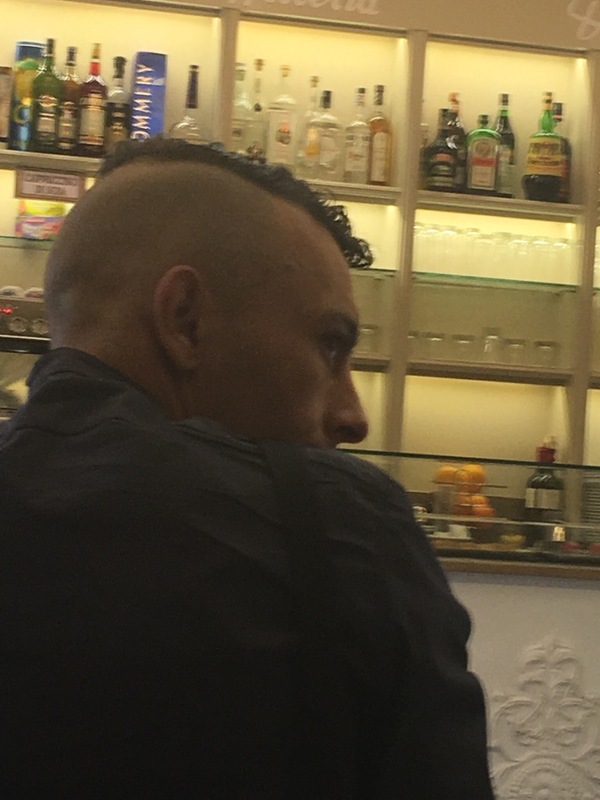 One such wearer came into my favourite cafe here in Florence.